Welcome to the start of the CSA season! Here is what to expect when you pick up your share. 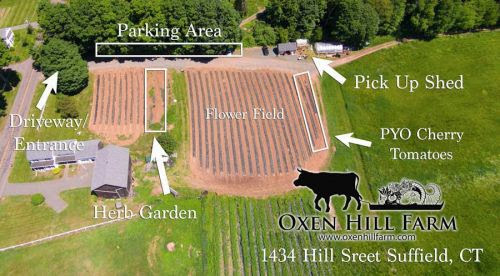 Oxen Hill Farm is located at 1434 Hill Street, Suffield, CT. The location can be mapped using Google or other direction services. 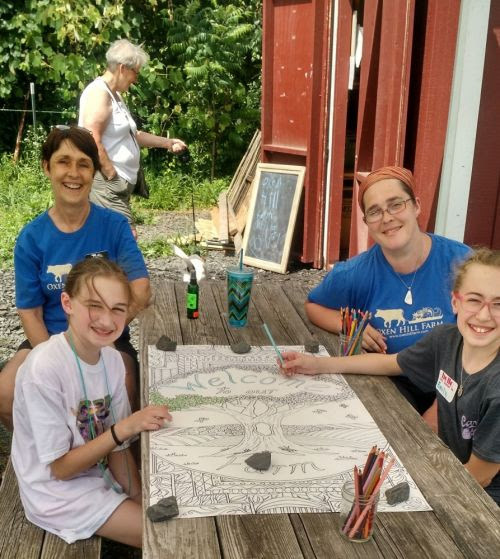 A white sign with our logo is next to the farm driveway (north of the white house, where the mailbox actually says "1449") so that members may drive to and park in the designated spaces, perpendicular to the fence line that runs from east-west, uphill of the dark-red and white shed. Where can I park at the farm? The drive and spaces are not paved, but have been prepared to ensure safe passage for all vehicles. When driving and parking, please be cautious of children and farm equipment moving about the farm and parking areas. Please disregard the herb location in this map, we have since built some raised beds for herbs near the shed and tomatoes, and haven't yet updated the aerial photo. Do I sign in when I arrive? You will be greeted in the dark-red and white pick-up barn by a member of the Oxen Hill Farm Team wearing a blue shirt with our logo. Please give us the name of the person who purchased the share, so that we may check your off on our list. How do I transport my share? On the first week of pick-up you will receive an Oxen Hill Farm tote bag that you can use to collect your share each week. Each share, Ox-Sized or Calf-Sized, receives one tote bag. If you forget your Oxen Hill bag, you may bring any other kind of container or you can use one of our plastic bags. How do I know which/how much produce to select? Your veggies will be presented in a farmers' market style display, grouped by variety, and you will choose a certain number of each item according to the share size you have purchased. For example, the first week Ox share might include two heads of lettuce, two bunches of radishes, a bunch of kale and some garlic scapes. 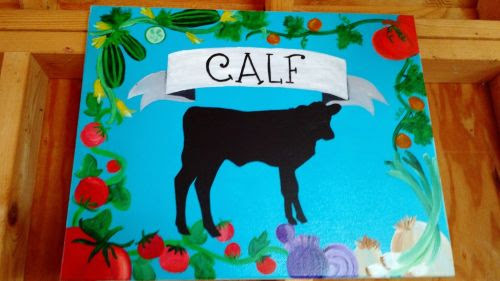 The Calf share might include one head of lettuce, one bunch of radishes, one bunch of kale and scapes. As more crops come to maturity, we will have a group of items in the "choice" section, where you will be able to customize your share to your tastes by choosing which items (the number of choices depending upon your share size) from a selection. 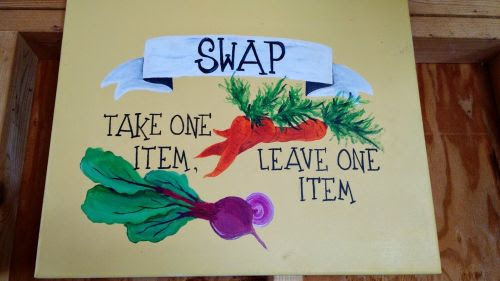 We will also have a "Swap Station" where you can exchange items from your share with other members if you would like. How do I go about splitting my share? We grow all of our own USDA Organic crops outside in the fresh air and sunshine and the bounty of the share will increase dramatically as the season progresses. If you are sharing a share with another person or family, it is up to you to decide how your share is divided. We suggest you either come together or alternate pick-up weeks, as we cannot "hold on" to or keep track of partially claimed shares. 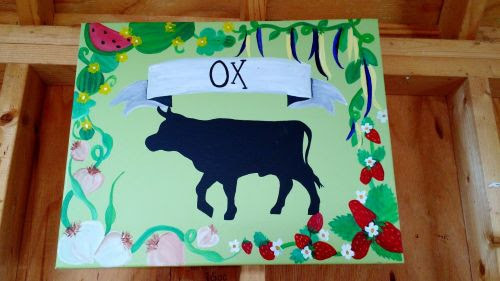 Please also note that an Ox share cannot be picked up as two Calf shares. What happens if I am not available to pick up any given week? If you are unable to claim your share personally, we encourage you to send a friend or neighbor in your place. Unclaimed produce is regularly donated to local soup kitchens. If you know a week or more in advance that you cannot make your regular pick-up, please use this page to request a switch of your pick-up day and/or location. We want you to get your produce, and we hope this will enhance the experience for our members while allowing us to maintain harvesting efficiency and minimize wasted food. What does my membership include in addition to my share? Herbs, grape and cherry tomatoes and more, will be available in a pick-your-own area as they mature throughout the season. You are welcome to pick your own items during regular pick-up hours. 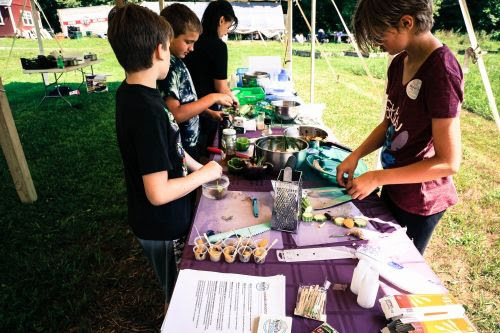 Cooking demonstrations and children's art activities will take place periodically at the farm over the course of the season. A schedule will be posted and shared as it is finalized on our website calendar. These activities are included with your membership at no additional charge. All members are invited to visit the farm and participate in these activities regardless of their pickup location. How does a workplace delivered box share work? The workplace delivered boxed shares contain prepackaged produce with additional replacement items. Members who have workplace delivered shares will have a choice item each week as well. The Full Sized box will be the same size as the Calf share at the farm, starting off with about 4-5 items per week and blossoming to 8-9 items per week in the peak of season. In the Mini Box, the number of different items will remain steady through the season (4-5 per week) and varieties of items included will be rotated between weeks during peak of growing season. 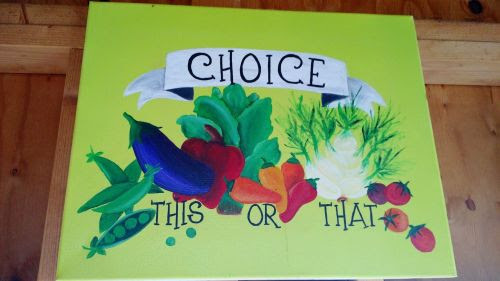 Like all fresh produce, you will need to wash it thoroughly at home before eating it. Our veteran members suggest getting a good salad spinner and prepping all veggies as soon as you get them home to ensure their maximum quality and usefulness to you during the week. Each week, you will also receive some tips on produce storage, farm news and events and recipe ideas. This newsletter will be emailed to you early in the week and you will get an email the night before your scheduled pick up as a reminder. Can I bring a pet to the farm? If you choose to bring a well-behaved pet to the farm, please, for the safety of our farm animals and your food, keep them on leash and out of the fields and the pick-up shed at all times. Please note that the white farm house and barns are not a part of the CSA and respect the resident's privacy.